Three Rivers Press, New York, 2008. 187 pages. Here’s a lovely, inspiring, exuberant book of encouragement for writers. 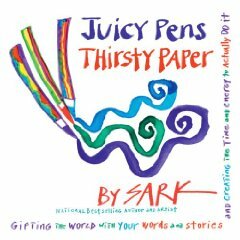 Handwritten in a rainbow of colors, SARK (Susan Ariel Rainbow Kennedy) knows exactly what to say to encourage writers to actually put pen to paper. “Last night I ate a lot of ice cream after dinner and then didn’t get much sleep from the caffeine in the chocolate. I could blame not writing on that too. “We forget that writing is fun and rewarding, or become convinced that it isn’t and load it up with all sorts of reasons why we can’t or don’t do it. We actually think so much about why we aren’t writing, that we forget how to use our energy to actually write. “There is no right or good time to write. There are always days that will be easier or more perplexing than others, but really it’s all just hilarious practicing. I call it hilarious because it’s subject to what life gives and brings us, and that is just so funny and variable. The book isn’t only inspiring quotations, but includes plenty of exercises and ideas to jumpstart your own writing. It would be better to purchase a copy and write in it than to do as I did and check it out from the library. Then you can add your own creativity and dip into it again and again. Just reviewing this book changes my attitude enormously! I love SARK’s joyful and joyous spirit. It’s contagious. If your own encouragement to yourself isn’t enough to get you to write, I strongly recommend SARK’s encouragement. This entry was posted on Thursday, August 13th, 2009 at 10:11 pm and is filed under Musings, Nonfiction Review, Personal Growth, Starred Review, Writing. You can follow any responses to this entry through the RSS 2.0 feed. You can leave a response, or trackback from your own site.